Friday July 26th we will start by having a 2 hour orientation from 7pm to 9pm. After class introductions we will discuss our goals for the weekend. 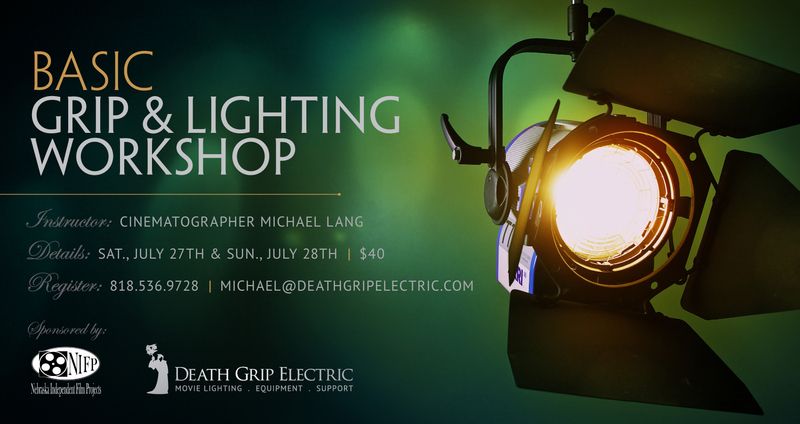 Plan on spending (2) 8 hour days receiving intensive lighting instruction. Tuition for the workshop is just $40.00. Due to the generosity of our sponsor, the “Nebraska Independent Film Projects” we are able to offer a $400 class at a huge discount. The price of tuition gets you a catered lunch on Saturday and Sunday, drinks and snacks throughout the workshop, a free Death Grip t-shirt and 50% off your next Death Grip equipment rental. ~ by Michael Lang on June 24, 2013. This entry was posted on June 24, 2013 at 4:47 pm and is filed under Announcements, Workshops.You can follow any responses to this entry through the RSS 2.0 feed.You can leave a response, or trackback from your own site. Previous: Intermediate Location Lighting Workshop Nov 30 – Dec 2!